Last year, I created a narrowly focused comparison between the monthly cost of owning vs renting the same home in Los Angeles. Then I showed some general charts for various cities in the US. Some places it seems better to rent. Some places it is better to buy. Much has changed in a year. Home values are up. Rents are up. Interest rates are up. Funny, how come the government says there is no inflation? We'll save that for another post. Where does that same comparison come out today. Last year the house was worth $650,000. Today it is worth $795,000. Last year the interest was 3.5%. Today interest would be 4.5%. Total monthly mortgage would be estimated at $3129 now vs $2441 a year ago. All of these estimates are from Zillow.com, and we can't totally rely on their numbers. In fact, the rent number seems suspect, as it has dropped from $3150 to $3125. Government statistics for cost of living specifically associated with rental of a primary residence showed a 2.7% increase in the LA area. Even so, that would only boost the rent by $90. My gut tells me that rents are up and that the 2.7% number might be more in line with reality. Last year, the owner would have had a $450 advantage over the renter for that same unit. This year that advantage is wiped out, and the renter is going to spend about $100 less than the owner. As noted in the previous post, there are many other factors to take into consideration when deciding to buy a home vs rent. But on a strictly cash basis, the Los Angeles renter wins by a nose this year. I believe owning a house is the most sensible job, which could benefit us life long. 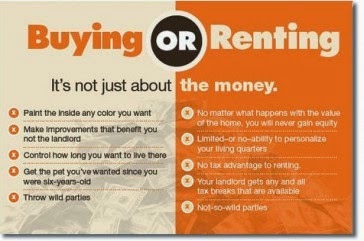 So Buying a house is better than renting. This is very good post for Mortgage Refinance Best Rates here.